(Oregon Coast) - So, the holidays are upon us like a bird of prey. There's no escaping now. You have a choice. Shop 'till you drop in your own home town inland, fight traffic, get your blood boiling with road rage and spoil that Christmas spirit. Or, you can head west, over the mountains, through the woods and to the coast, and do this shopping thing in a relaxed fashion and find some truly unique gifts. Then, after a calming yet exercise-ridden day, you can retire that evening to the lulling sound of the waves. The entire Oregon coast is filled with far too many interesting shops to list in one article, but here's a few stunning examples you may not have thought of. Tourists and locals alike have been shopping addicts out here for years - and the numbers are growing. In Newport’s ultra charming (and rather chic) Nye Beach, Village Market & Deli is full of beachy surprises with a continental theme. Santa has already dropped off great gift goodies: three kinds of panetone from Italy, wine books, cheese books and the Market wine and oil sets, plus their always stunning collection of imported cheeses, meats, fresh baked bread, and more. 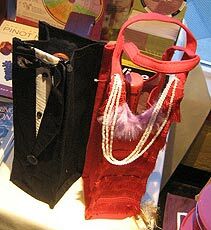 There are holiday gift bags with some innovative designs, including a pair where one looks like a man’s tuxedo and the other is dressed like a lady’s formal flapper dress. They are actually not only stunning but cute and even hilarious. Another highlight are the antique reproduction corkscrews, which look just like the real thing from perhaps 100 years ago, in various designs and forms. At the beach end of NW 3rd, Newport. (541) 574-9393. Down in the Central Coast town of Yachats, Raindogs carries artisan jewelry from around the world, gifts for babies or pets, music, sculptures, as well as bath and spa accessories. www.raindogsonline.com. 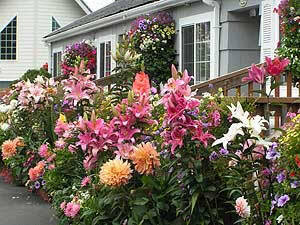 162 Beach St. (541) 547-3000. In the last year, Manzanita resident Rachel Sip started an idea that’s not only different but needed in the world of gift registries RegisterLocally.com. Instead of signing up at one particular large store for your registry, why not have the entire coast at your disposal with its unique, handcrafted items? Sip also added another interesting slant by including the element of eco-friendly gift items. She was inspired by noticing that at the bridal and baby showers of friends, the best gifts were the indie ones purchased from smaller shops on the coast. The site is still relatively new, but new places are added all the time. And you can buy with the good conscience of knowing you’ve supported local small business people as well as assisted the environment. There are all kinds of gift ideas floating around this little gem of a site, not just bridal or baby shower ideas. There’s also a section for Portland gift ideas. This ain’t your parents’ online shopping spree. www.registerlocally.com. If shopping for coast-oriented gifts with an incredible, panoramic ocean view sounds appealing, this shop atop Cape Foulweather, just north of Newport, is the ticket. 500 feet above sea level, the Lookout overlooks just about everything. A double dose of history, the 1937 building sits on top of the gigantic cape first spotted and named by British navigator Captain James Cook in 1778. Inside the shop, you'll find an incredibly large array of curious and gifts, like myrtlewood, coral, shells, collectibles and a horde of coastal postcards. You'll find coasters made of sandstone, complete with etchings, old floats, hand-painted beach scenes, beach candles, beautiful lighthouse collectibles and a load of cute Christmas ornaments with a beachy theme. Purchase a wide variety of coastal garb, from sweaters, hats and t-shirts to cozy footwear - to remind you of your favorite part of Oregon. 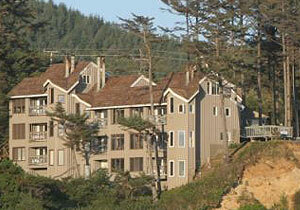 The Lookout is located on Cape Foulweather, north of Newport, and just north of the Inn at Otter Crest turn-off. (541) 765-2270. What would Christmas shopping be without a trip to Oregon's biggest outlet malls? 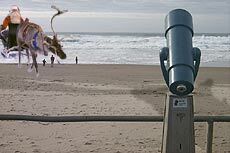 By far, the best of them lay on the coast, including Seaside's sizable outlet mall right on 101. But in Lincoln City, one of the largest in the state is the Tanger Outlet Mall, with 65 stores crammed with designer names and national brands. Among the treasures you'll find are big names like Bass, Big Dogs, Book Warehouse, Carter's Childrenswear, Casual Male Big & Tall, Coldwater Creek Outlet, Columbia Sportswear, Dress Barn, Easy Spirit Outlet, Eddie Bauer, Factory Brand Shoes, Gap Kids Outlet, Gap Outlet, Jockey, KB Toy Outlet, Koret, L'eggs Hanes Bali Playtex, Levi's Outlet By Most, Liz Claiborne, London Fog, Mikasa, Motherhood Maternity, Norm Thompson, Old Navy Outlet, Oneida, OshKosh, Pendleton Woolen Mills, Perfumania, Pfaltzgraff, Quiksilver, Reebok, Rockport, Samsonite, Tools & More, Totes - Isotoner - Sunglass World, Tree of Life Christian Outlet, Van Heusen, Wilsons Leather Outlet, Zales The Diamond Store Outlet and the wine store, Chateau Benoit, among others. There's a convenient parking garage and a quaint, village-like atmosphere. Holiday hours can vary. 1500 SE East Devils Lake Rd, Lincoln City. (541) 996-5000. 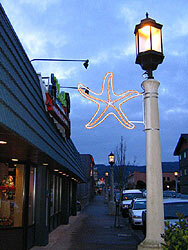 If starfish are your thing, you'll love this town. Step into nature and be enveloped at the Wild Bird Shop. Inside, it's filled with a glowing ambience that's soothing, created by a variety of natural products, warm lighting, plants and lovely music. Browse the beautiful tapestries and check out the stunning original outdoor fountains created by store co-owner Brian Godfrey, all made of local rocks and other materials. There are field guides for bird enthusiasts, hummingbird feeders, weatherproof bird feeders, ceramic starfish, relaxing music CD's, natural soaps and lotions, a variety of wildlife art and wind chimes. A sizable catalog exists on 123 S. Hemlock. Call: 800-281-9806. www.wildbirdshop.com. Does someone you know dig fossils? Do they also dig the beach? Newport's Guy DiTorrice is known as Fossil Guy, leading tours around Central Coast beaches to show you how to find all kinds of fossils. It's a lesson and a fun beach walk all at the same time. DiTorrice provides fossil field trip gift certificates at $29 per person, and discounts made for groups of eight or more. Pre-payment can be made at OregonFossilGuy@hotmail.com. www.OregonFossilGuy.com or call (541) 961-1762. History takes a delightfully beachy turn at Newport's Burrows House and Oregon Coast History Center. 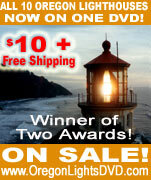 Check out its store for a huge selection of books on heritage cooking and gardening, coastal Native Americans, early settlers, videos and DVD's on Oregon lighthouses, early coastal hotels, logging and railroads, and early transportation. You'll also find activity books and kits, T-shirts, sweatshirts, and hats. Video/DVD selections include "Yaquina Rails: from Tree to Sea," "The Road from Mud to Glory" (early travel on the Central Coast) and "Rooms with a View" (famous and infamous hotels in the area). For books, there is the cookbook "All About Crab," "Beachcombing the Pacific," "Glimpses of the Seashore" (early photos of Nye Beach by A.L. Thomas), "Lincoln County Lore" and various books on shipwrecks and other bits of local history. 545 SW Ninth St., Newport. Call: (541) 265-7509. Ekahni Books in Wheeler, and its sister business next door, Wheeler Antiques, are filled with a huge array of interesting gift items with a local slant. There's a load of interesting book titles from the region, which is something Ekahni specializes in all year. Look for books and chapbooks by North Coast writers Gwendolyn Endicott, Tom Bender, Nancy Slavin and Gail Balden. One big favorite is "I Am Karla's Smokehouse," by legendary Rockaway business owner Karla Steinhauser - who has been smoking fish, poultry and meats for 39 years. It comes packed with her renowned tips and techniques for smoking and cooking salmon, as well as her own artwork and historical photos. For a mere nine bucks, you can get an "Instant MBA:" a Master of Beachcombing Arts. It looks like a degree, with your name on it, but it's signed by "R. Sandy Shores, Ph. D." and Sir Francis Drake. It's the perfect gift for the serious beach bum in your life. At the tiny little charmer of a store, you'll find various travel guidebooks on Oregon and its coast, tidbits of local history like the stories and photos of "Tillamook: Lest We Forget." Hwy 101, Wheeler. Call 503-368-6881 for more information or to order the Instant MBA. 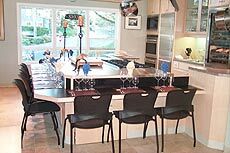 Fine wine is always welcome at Christmastime, and the Nehalem Bay Winery is certainly the hotspot for this on the north coast, as well as on the central coast at Depoe Bay Windery. For the holidays, they spotlight the slightly spicy "Santa's Elixir," as well as sweatshirts with that little, whimsical logo emblazoned on them. This delightfully unusual place adds a fun, new slant to the whole wine tasting experience. Check out www.nehalembaywinery.com or make sure you stop by on your next visit to the area. Highway 53 - about two miles from Wheeler. 1-888-368-WINE. The very northwestern corner of Oregon provides a lot of atmosphere for your shopping, with its steep hills, rugged, ancient Victorians oozing charm and a vibe reminiscent of old San Francisco. It's like stepping back in time - but you're never sure which era, exactly. There are so many to choose from all around you. For the diehard Oregonian, umbrellas of all types - including ones with Astoria themes - can be found at Let It Rain (1124 Commercial St., 503-325-7728). Chris' News has a coastal theme with local souvenirs, and maritime and nautical gifts (1412 Commercial St., 503-325-2832). Dig into Astoria's past with Scandinavian gifts at Finnware 91116 Commercial St., 503-325-5720). There are more coastal themed gifts and local souvenirs at Tiki Charters (350 Industry, 503-325-7818). A Gypsy's Whimsy Herbal Apothecary also carries such items, as well as natural products (1139 Commercial St., 503-338-4871). Giving the gift that shows you have no imagination? Here's a great way to cover that up: a gift certificate from the Oregon Coast. 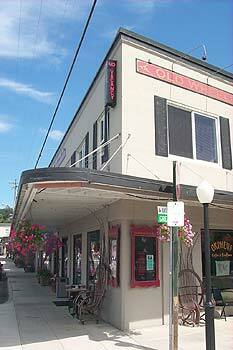 In Cannon Beach, Primary Elements Gallery has gift certificates that come in arty designs. They also offer free gift-wrapping, mailing services, and free delivery of large or heavy art pieces in a certain price range. Sandpiper Square, 172 N Hemlock. 866-871-0220. If you love Mo's Restaurants (Cannon Beach, Newport and Lincoln City), you can give a bit of them to a friend. The Lincoln City restaurant sells gift certificates by phone. 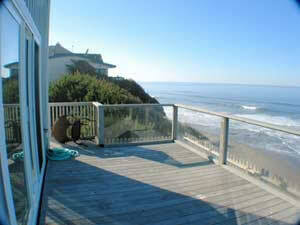 860 SW 51st, Lincoln City. (541) 996-2535. 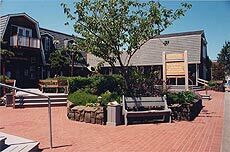 A huge variety of places in Lincoln City offer gift certificates: so many that the Visitors Center has a special section for it on their webiste at www.oregoncoast.org/gifts. 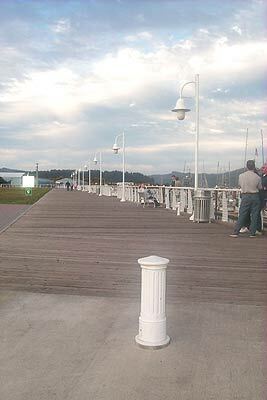 For fine dining pleasures, you'll find the BayHouse and its glorious view of Siletz Bay. 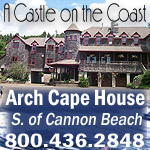 They also offer gift certificates on Lincoln City's website and at their restaurant. 5911 SW Hwy. 101. (541) 996-3222. In Newport, they’ve got’em as well, at Rogue Ales’ House of Rogue Bed and Beer. This will get you goodies at all their outlets, including Portland and Astoria. 748 SW Bay Blvd on Newport’s Historic Bayfront. www.rogue.com. For reservations and gift certificates: Stacey@rogue.com or 541-961-0142. See the larger article from BeachConnection.net, featuring lodgings and other unique businesses that offer gift certificates.